I usually claim Lamberto Bava only directed three really good movies: Demons, Blastfighter and You'll Die At Midnight, but truth be told he's made some other decent movies (and I'm not counting Blade in the Dark to those). 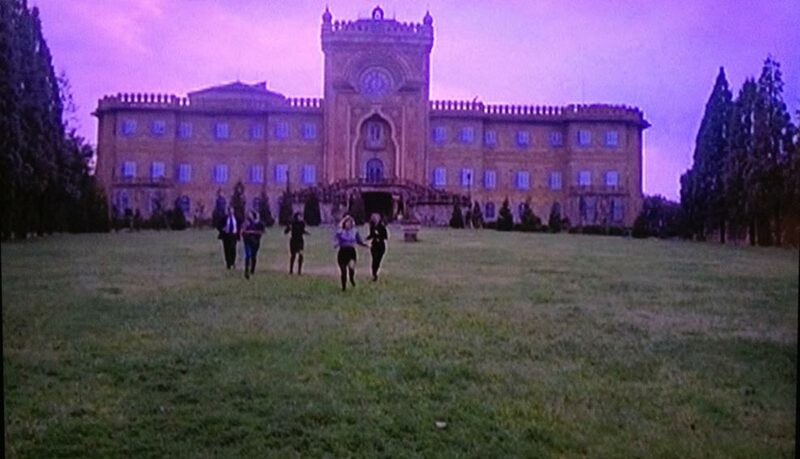 One of them is the fun and colourful Dinner with a Vampire, according to IMDB one of four movies made for Canale 5 under the banner Brivido Giallo. Like many Italian horror movies made for TV the gore is less than usual, but often a bit more than American counterparts - and so even here, which makes this ambitious production raise slightly above average. Jurke (George Hilton) is a famous horror director who also happens to be a 1000 years old vampire. There's just one thing: he's pretty tired of being alive and tries a slightly unorthodox way to kill himself: he hires a bunch of young wannabe-actors for a movie, but instead he invites them over to his castle over the weekend and gives them an ultimate, either they kill him or he will kill them all! Now our heroes must find a way to kill something that can't be killed, before Jurek unleashes himself and his monster army on them! 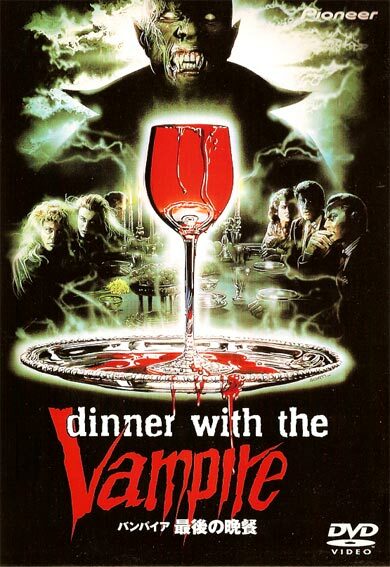 Dinne with a Vampire has a very light-hearted feeling with a lot of in-jokes, from the obvious nods to Mario Bava and the very cool black & white gothic horror movie the kids are watching (it feels like Lambert put a lot more effort into that than the rest) to small stuff like one of the characters is trying to choke Jurek the vampire with Roman Polanski's Fearless Vampire Killers (written in English on the tape, but changes to the Italian title, Per favore, non mordermi sul collo!, moments later). Another tape visible in the same scene is Black Sabbath! If I wasn't so lazy I would have taken a couple of screenshots of the interior, which looks like something right out of Suspiria - just without the creative lighting. Layers upon layers of weird patterns and colours. I would get dizzy if I lived there, but I would love to visit the place some day if it's open for the public. What's not working is some of the broader comedy, like the hunchback - dubbed by Nick Alexander doing a Marty Feldman voice. He's not important at all for the story, just some padding to make it a slightly longer movie. Another disappointment is that the monster army hardly is in the movie, just a few seconds at the end and they hardly do anything. Many years ago, on the page Cinema Nocturna I think, someone claimed that Dinner with a Vampire was completely dry, no gore or blood at all - but it actually has some very nice effects including a wonderful heart-being-squeezed-out-from-a-chest and a graphic melting head (plus a few effects here and there) and the make-up looks very cool, specially in the black & white movie within the movie. It's clearly visible Lambert enjoyed making this movie. It's closer to the non-horror he likes so much and he had a glorious location to shoot + an inspired George Hilton doing his best to over-act himself into Italian horror movie history. It's worth a watch for you who needs yet another obscurity in the collection. "I usually claim Lamberto Bava only directed three really good movies: Demons, Blastfighter and You'll Die At Midnight"
I heard good things about Blastfighter. But I don´t think I´ve seen any of Lambertos films. "to small stuff like one of the characters is trying to choke Jurek the vampire with Roman Polanski's Fearless Vampire Killers (written in English on the tape, but changes to the Italian title, Per favore, non mordermi sul collo!, moments later)." "Many years ago, on the page Cinema Nocturna I think, someone claimed that Dinner with a Vampire was completely dry, no gore or blood at all"
Could be that the poster saw a cut version of the movie..? "It's clearly visible Lambert enjoyed making this movie." Sounds like it, good review ninja, thanks for the tip.